Following Slavoj Žižek’s relatively reasonable reflections on world power and Ukraine in The Guardian this week, I was told that someone has uploaded his new-ish documentary The Pervert’s Guide to Ideology to Youtube. This installment follows on from his 2006 film The Pervert’s Guide to Cinema, which was also directed by Sophie Fiennes. Like the earlier film, this is Žižek at his most accessible, riffing, in his way, on some well known Hollywood films like Taxi Driver, Full Metal Jacket and The Dark Knight, along with some other, less well known offerings. Those familiar with Žižek’s shtik will have heard some of the gags and observations before, and, of course, everything is ‘ideology at its purist’ but nevertheless the film provides an enjoyable enough distraction for those interested in film, theory etc. A very quick post, following some prodding from Mark Murphy of the ever-excellent Social Theory Applied blog, but one with an oblique relationship with social theory as such. The New England poet Charles Olson, a key member of the Black Mountain School of American Poetry, was also one of the most philosophical poets of his generation. In particular, Olson’s poetry is heavily influenced by the process metaphysics of A.N.Whitehead. Olson made his debt to Whitehead explicit, referring to him often as ‘my cosmologist’ and his poetry can be read as a dialogue with, and cannot be properly understood without reference to, Whitehead. A poem is energy transferred from where the poet got it (he will have some several causations), by way of the poem itself to, all the way over to, the reader. Okay. Then the poem itself must, at all points, be a high energy construct and, at all points, an energy-discharge. So: how is the poet to accomplish same energy, how is he, what is the process by which a poet gets in, at all points energy at least the equivalent of the energy which propelled him in the first place, yet an energy which is peculiar to verse alone and which will be, obviously, also different from the energy which the reader, because he is the third term, will take away? how the principle can be made so to shape the energies that the form is accomplished. And I think it can be boiled down to one statement…ONE PERCEPTION MUST IMMEDIATELY AND DIRECTLY LEAD TO A FURTHER PERCEPTION. It means exactly what it says, is a matter of, at all points (even, I should say, of our management of daily reality as of the daily work) get on with it, keep moving, keep in, speed, the nerves, their speed, the perceptions, theirs, the acts, the split second acts, the whole business, keep it moving as fast as you can, citizen. And if you also set up as a poet, USE USE USE the process at all points, in any given poem always, always one perception must must must MOVE, INSTANTER, ON ANOTHER. Thus, the poem is ‘organic’, it grows, from the inside out. It is, fundamentally, like nature, processual. What seems to me a more valid formulation for present use is “objectism,” a word to be taken to stand for the kind of relation of man to experience which a poet might state as the necessity of a line or a work to be as wood is, to be as clean as wood is as it issues from the hand of nature, to be as shaped as wood can be when a man has had his hand to it. Objectism is the getting rid of the lyrical interference of the individual as ego, of the “subject” and his soul, that peculiar presumption by which western man has interposed himself between what he is as a creature of nature (with certain instructions to carry out) and those other creations of nature which we may, with no derogation, call objects. For a man is himself an object, whatever he may take to be his advantages, the more likely to recognize himself as such the greater his advantages, particularly at that moment that he achieves an humilitas sufficient to make him of use. This is an Object Oriented Ontological Poetry in all but name (on which, see Morton (2012)pdf), as well as a process poetry. The clip, and the one after it, are of a short documentary featuring Olson from 1966. In the first one, he reads ‘Maximus to Gloucester’ again. In the second he reads The Librarian. There is lots more to be said – the connections between the poet and the philosopher have been subject to a number of analyses, such as Blaser (1986), and more recently Bram (2004) – and I haven’t even mentioned Olson’s Maximus Poems, but for now, I leave Olson speak for himself. Another interesting ‘poet of process’ is A.R.Amons, but I may return to him at another time. What the post is intended to provoke is an exploration of the link between philosophy and art, between poetry and theory. What Olson does is theory as poetry, which is, to me, an interesting approach. (W)hether the TV hug has become oppressive and limiting….That not only has it become a rigid convention – as rigid as anything in Victorian times – but because it teaches that we should concentrate on our own inner feelings, it also stops us from looking outside ourselves and thinking imaginatively about the society and the world around us. I want to suggest that the Hug has become a part of the modern problem of not being able to imagine any alternative to the world of today. The Hug is no longer liberating, it is restraining. The term is difficult, but ‘feeling’ is chosen to emphasize a distinction from more formal concepts of ‘world-view’ or ‘ideology’…. We are concerned with meanings and values as they are actively lived and felt, and the relations between these and formal or systematic beliefs are in practice variable…. An alternative definition would be structures of experience…. We are talking about characteristic elements of impulse, restraint, and tone; specifically affective elements of consciousness and relationships: not feeling against thought, but thought as felt and feeling as thought: practical consciousness of a present kind, in a living and interrelating continuity (Williams, Marxism & Literature, pp.132-3). While Williams, at the time, was almost apologetic about using the term ‘feeling’ and at pains to justify it’s use, today, post the (so-called)’affective/emotional turn’, we can perhaps be more confidant in speaking of these matters. For me, what the clips suggest or display is an emotional world and an emotional ‘being-in-the-world’ (or what might be called an emotional habitus) that is at once familiar, yet fundamentally different from the ones most of us live in and have today. Take, for example, the first clip on Anna Neagle, who caused a scandal in 1958 by weeping, openly and continuously, in an early This is Your Life. Both the programme makers and the public in general appear to have been scandalised by the public display of emotions and the lack of emotional control. Even more poignant and unusual is the tale of Ministry of Defence clerk, Francis Beveridge, who’s generalized and articulate melancholia, is fascinating and strangely affecting. The post is long, mainly due to the clips, but I recommend that you try to watch at least some of them. One reflection on reading and viewing them again was that clips such as these, the archives of old documentaries in particular, might be useful tools for the contemporary sociologist of emotion in researching past emotional cultures and regimes, but also for teaching students about these (and other) core sociological concepts. These appear to be under-utilized, yet clearly useful resources. EDIT: Link to blog fixed! Also here. 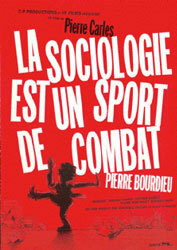 Bourdieu: Sociology as a Martial Art. It has transpired that I will now have the dubious honour of teaching Bourdieu to the final year contemporary social thought class here in NUIG, in addition to Elias, Foucault, and the general introduction. Yea… As I began to think about this today, and how I might go about it, I remembered a documentary that Loïc Wacquant had recommended to me in Frankfurt a number of years ago when I was starting out on this (damned) project, about Bourdieu and his work. I tried to track it down then but to no avail. Today, however, some of it at least is available on youtube, and I am posting these 7 parts here. I am not sure how long it will remain available so watch it now.